This week, I'm participating in a relatively new link-up at Adventuroo, called Capture the Everyday. The theme this week is 'something you love about your home.' Our home is a work in progress. We bought the house because of the floor plan and the neighborhood (and the hardwood floors... love those). We've changed almost every light fixture and painted every room in the past year. Next up is a kitchen remodel. As someone who doesn't really enjoy home improvement, my feelings about our current house are a mixed bag. But one thing I do love? We're three houses away from the Columbus People Trail. This is the bike/walking path that runs all over town. We can hop on our bikes and visit all sorts of fun places in minutes, while feeling the wind blow on our faces and getting some exercise in the process. 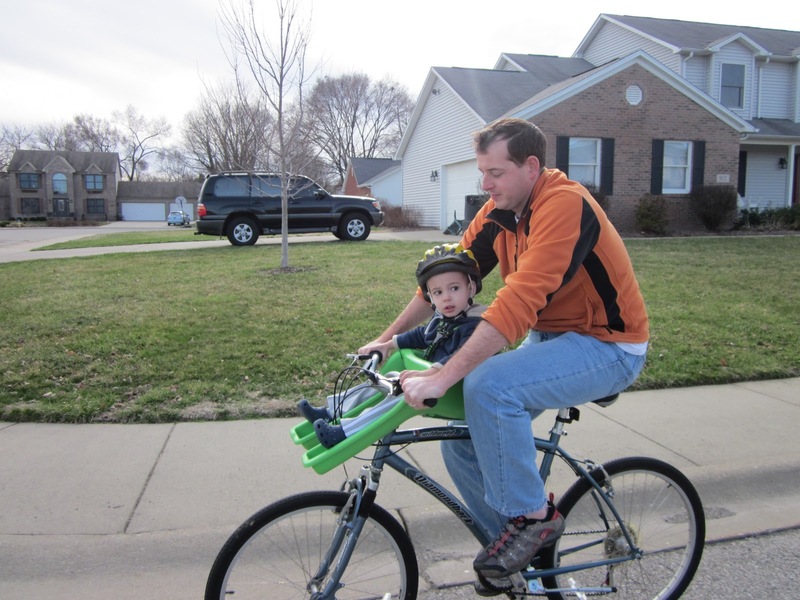 I'm thankful the weather has warmed up in recent days and family bike rides have once again become a nightly tradition. Curious about our bike seat? 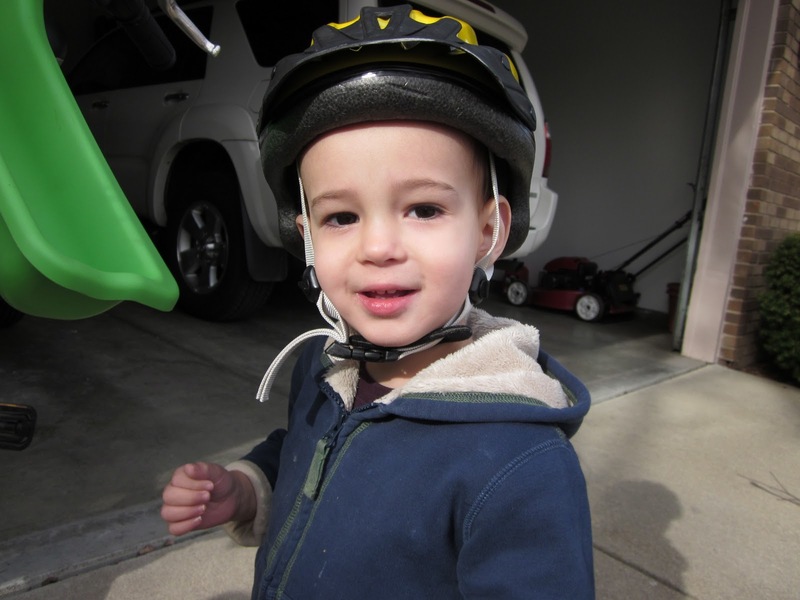 It's an iBert Safe-T Front Mounted Child Bicycle Seat ,* which I wrote about here. If you want to plan a bike ride around mealtime, you could stop for breakfast, lunch or dinner at Hangar Five from the trail near Blackwell Park and watch the planes take off and land while you eat. I wish I lived that close to a bike-trail! Excellent perk. Love that you shot a picture of the garage. My husband waxes poetic about how "someday" we'll have a house with a garage. It's great that you have such an awesome bike trail nearby too. My hometown had a great one, and it was a great escape for my middle school angst. I could just go ride and let my troubles fly away. Also, love the background color of your blog. So awesome! We have a great bike trail nearby too... but we have no bikes (sad face). I LOVE that kids' seat though-- way too cool. Love that bike seat! What a great way to hang as a family ... and get a little fresh air and exercise. That is awesome! We are really close to a park with trails but we have to cross a main road to get there which is a pain. How cool that it's so close! I feel ya. My favorite thing about my house isn't something that's actually inside it...more like attached to it. Way to go thinking outside the box! Um, Jealous!! We used to live in this amazing master planned community in Utah. Sidewalks and trails all over the community with a made made lake( lol it was Utah, after all!) that had tons of places to ride bikes and take evening walks.